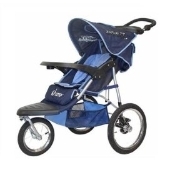 This go-anywhere, do-anything stroller has loads of storage and features a parent console. Our swivel-wheel stroller gives parents and children safety and maneuverability with 12" wheels that can also lock in place. Great for going to the beach. Please do not take in the water. For children up to 50lbs. Colors and styles may vary.